Uber Product Manager Zach Singleton worked with The Hidden Genius Project to create the Career Prep Program. 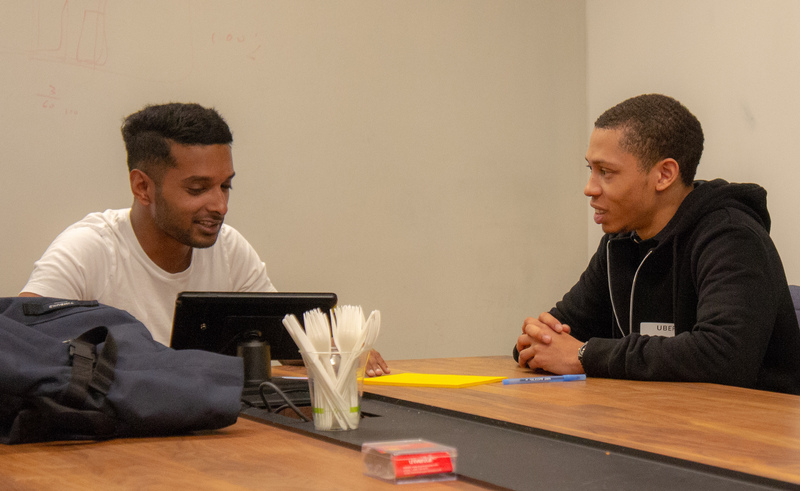 In conjunction with The Hidden Genius Project, Zach took the lead in designing the curriculum for Uber’s Career Prep Program, a year-long course that prepares program participants for technical interviews and gives them an understanding of what it is like to work at a technology company, a sector that has not widely recruited and retained black male talent. We sat down with Zach to get his take on issues of inclusion and diversity in technology, and how The Hidden Genius Project is working to improve the situation. Can you give an overview of The Hidden Genius Project and Uber’s involvement? The Hidden Genius Project started with a focus on training black male youth in computer science, leadership skills, and entrepreneurship. Its flagship program, an intensive 15-month immersion program, is for high school students in the Bay Area. It was started by three gentlemen who met through the Ron Brown Scholar program, one of the most prestigious undergraduate scholarships for African Americans in the United States. The Hidden Genius Project started with a focus on training black male youth in computer science, leadership skills, and entrepreneurship. Two of the founders, Jason Young and Tracy Moore, went to Harvard and started Mindblown Labs, which built an app to teach people about financial literacy through gaming. They wanted to start a nonprofit dedicated to broadening STEM education access for black male youth, and that became The Hidden Genius Project. I knew Brandon Nicholson, who helped start the project as founding executive director, from high school. We both grew up in Oakland and attended Marin Academy in San Rafael. Nicholson studied education, and eventually earned his Ph.D. in Education Policy at the University of California, Berkeley. I studied economics in undergrad, got an MBA from Stanford, and spent three years at Google before joining Uber in 2016. Once at the company, I joined The Hidden Genius Project’s advisory board because of my passion for this area and relationship with Nicholson; then Jordan Medina, from Uber’s Policy team reached out, asking how we can create a deeper partnership. As part of a company-wide effort, Jordan was looking for opportunities to promote diversity at Uber. Around the same time, I facilitated a discussion between Uber’s Security Team and UberHue on how we could participate in driving a cultural change both within and beyond the company; we landed on promoting and supporting The Hidden Genius Project’s STEM education initiatives. How does the partnership between The Hidden Genius Project and Uber work? For the partnership, we came up with The Hidden Genius Project Career Prep Program. It’s a year-long program and the requirements are that you are a black male, enrolled in college, and studying computer science or planning to transfer into computer science. We have two goals: one, we want to ensure our fellows are not only capable of passing a technical interview, but that they are excited and eager to get to that point because they know they will crush it, and two, we want to make sure that once you are in an engineering role, you understand what it takes to be a rockstar. We don’t just want our fellows to get jobs, we want them to move into positions of leadership so they can make changes at a higher level, and make it easier for not only their own community, but other underrepresented groups to find meaningful roles at technology companies. Uber engineer Logan Jeya conducts a mock technical interview with Hidden Genius Project fellow Brandon Lee. Among our first group of fellows, five of them are from the Bay Area and we’re flying 12 in from other places around the country. And as a third goal, we want to help fellows from outside the Bay Area land comfortably in this community, because it can be a bit jarring here. Atlanta, Chicago, New York, and Virginia all have higher concentrations of black professionals. We want to mentally prepare our fellows for what it would be like moving or building a family here, or just everyday things like where to get a haircut. These are real questions that I’ve seen talented people run up against, like they’re doing well in a technology role, but they just don’t feel comfortable settling in to Silicon Valley. I want to address that up front, too, so that our fellows know how to come in and be successful in the community as well as the work place. Right now, the The Hidden Genius Project only focuses on black males, but longer term, it is looking to open up the curriculum to other groups. And I’d love to explore opportunities to work with other tech companies and non-profits. What do you think of the cultural differences between the Bay Area and places like Atlanta or Virginia? The black communities in places like Atlanta, DC, and Chicago have been around a lot longer and are more structured. My sense is that these communities tend to have a larger critical mass of people with advanced degrees relative to the West Coast. My grandparents from both sides of my family came to California from Arkansas and Texas about 70 years ago because of opportunities working on the railroads and in the shipping industry. I have a lot of relatives who belong to the Longshoremen’s Union. Ryan Coogler, who directed Black Panther, is from Oakland and his family was also in the Longshoremen’s Union, so it’s a common thing here. People from my mom’s generation and before could earn $100,000 a year working as longshoremen or flight attendants with no college degree. The advancement of technology changed all that over night, so that now, if you want to buy a house and raise a family here, it’s very helpful to have a 4-year degree and even better if it’s in the STEM fields. That sounds like a good reason to base The Hidden Genius Project in the Bay Area and focus on the tech industry. In part, because this is the center of tech in the world, there are a wealth of resources here. However, there’s not necessarily a critical mass of population for us to work with, which is why 12 of the fellows that passed our interview process are coming from outside the Bay Area. We definitely worked to identify people locally, but we found fewer local candidates than anticipated, and The Hidden Genius Project’s high school program is relatively new, so doesn’t have many college-age alumni yet. What really sticks out is that, in 2015, a study by sociologist Maya Beasley found that six percent of all computer science degrees conferred went to African-Americans, yet that same demographic only represented one percent of engineering departments at top tech companies such as Twitter, Google, and Facebook. It was similar for Latinos. In other populations, those numbers are more closely aligned. To me, that statistic of six percent versus one percent is a problem, because it means people who are qualified and capable are not getting through. For some reason, they’re not arriving here. What is Uber bringing to the Career Prep Program? Curriculum design, homework design, one-on-one mentorship, and hands-on instruction. We’re reviewing the code that the fellows are writing. There’s a GitHub repository where fellows share the code they are working on so their mentors, Uber engineers, can review it. The fellows have to set OKRs, just like we do as employees. They define goals for what they will accomplish between each session, and their mentors review these goals and sign off on them. Each of our engineers familiarizes themselves with the college coursework and technical experience of the fellows they are mentoring, so they can individually calibrate what they think the fellows should be able to accomplish between sessions. This is important because the fellows all come from different engineering programs. One of them is a freshman, three are seniors, and the rest are juniors and sophomores. While we have a standard curriculum we deliver when the fellows are here with us in person, we customize the program around their goals for what they want to achieve. What are the challenges black males face when going from college to trying to get a job at a technology company? Let me start with challenges in the college setting. As an example, when I was an Economics major at UC Berkeley, I was in a microeconomics lecture with 200 other students. I think I was the only black person in the class. I missed a lecture, and the professor, who probably thought she was doing something good, emailed me to say “Hey, I didn’t see you in class.” I’m wondering if she sent emails to any of the white or Asian students, and I’m thinking she probably didn’t, because it would be hard to notice if any of them were missing. A black engineering student in a majority white and Asian class is more likely to be noticed, not necessarily in a good or a bad way, but that means added pressure. Sometimes it can also be hard to form study groups with your peers, because we tend to naturally gravitate toward people with commonalities and similar interests. And if you aren’t spending that time with other students in your academic circle, you might not hear that a recruiter is coming to campus, or about a book that tells you how to get through a coding interview. These are the kinds of things that might be passed amongst small groups of students trying to help each other move forward. You can be studying hard, getting good grades, but it often takes more than that to find these opportunities. When a black man shows up for an interview, there’s like a 95 percent chance that the person conducting the interview won’t look like him. When a black man shows up for an interview, there’s like a 95 percent chance that the person conducting the interview won’t look like him. Everyone knows that part of the interview process is the elevator test, as in would I feel comfortable getting into an elevator with this person? Or would I want to grab a coffee or a drink with them after work? Do I see you fitting in with my team? I don’t think this is anything intentional, but there’s a tendency for someone to believe that folks who look like them have similar interests, come from a similar background. And this dynamic is bi-directional in the sense that an interviewer may not be used to seeing a black male student, and the student may be thrown by the fact that everyone they meet with doesn’t look like them. This dynamic makes for an awkward interaction not only during a behavioral interview, but also a technical interview when someone is asked to solve a coding problem on a whiteboard in real time. How does the Career Prep Program address those challenges? The first session of the Career Prep Program focuses on the difference between engineering in practice and the academic setting, because universities don’t generally prepare you for the workplace. In computer science, students take classes in data structures and algorithms, but those don’t translate exactly to a technology company where you have to work with a designer, a product manager, and your engineering teammates. It’s not about getting a good grade anymore, it’s about meeting deadlines and collaborating with others. The first session of the Career Prep Program focuses on the difference between engineering in practice and the academic setting, because universities don’t generally prepare you for the workplace. During our first workshop, one of our fellows asked, “You guys have more than a thousand engineers here, right? If all those engineers are working on a project, how do they communicate? How do they make sure things are landing on time and sequenced? Is there a tool for that?” That’s one of the little things we can demystify, something that might seem obvious if you come from a family and community with people already in engineering. But if you come from a group that’s underrepresented in engineering, you probably don’t have any friends or family that can give you that context. What’s your advice for adapting to the culture of a technology company, where people might be playing foosball and ping pong during the work day? At Google, we had bowling alleys and massages, but I was there for three years and never did any of that. I would advise our fellows to pretend it’s not there because if you’re over there playing ping pong a couple of times a day, people are going to notice, just like in my classroom experience, more so than they’re going to notice other people. It shouldn’t be a problem, because everyone else is doing it, but it’s a potential risk. I actually think our fun, playful culture can be misleading. You want to establish your reputation first, so people know what you’re about, what you can deliver, know that you are a rockstar. Then go and do all the fun things that are here, so people don’t accidentally make assumptions about you that aren’t true. In the other direction, how should the culture here adapt to young black men coming into the company? We all need to participate in being part of the solution, not just for the black community but for all underrepresented communities. We all need to play a role in creating an inclusive culture, much in the same way that technical teams need to work together to ship something. For instance, I’m the product manager for Uber’s Privacy Engineering team, so my example comes from our work to comply with the European Union’s General Data Privacy Regulation (GDPR). This effort is so large in scope that my team can’t tackle the issue alone. We need each individual in the company to help move the needle, to take ownership of their part in to help us move this forward. Making the workplace welcoming for all groups is no different. It’s everyone’s responsibility to say “hi,” shake someone’s hand, look them in the eye, respect them, get to know them, find out about their lives. We can talk about the real issues we have, whether it’s here or out in the community. That individual effort matters so much, because if we only rely on our Diversity and Inclusion team or Human Resources (HR) to solve these types of problems, it’s just not going to work. 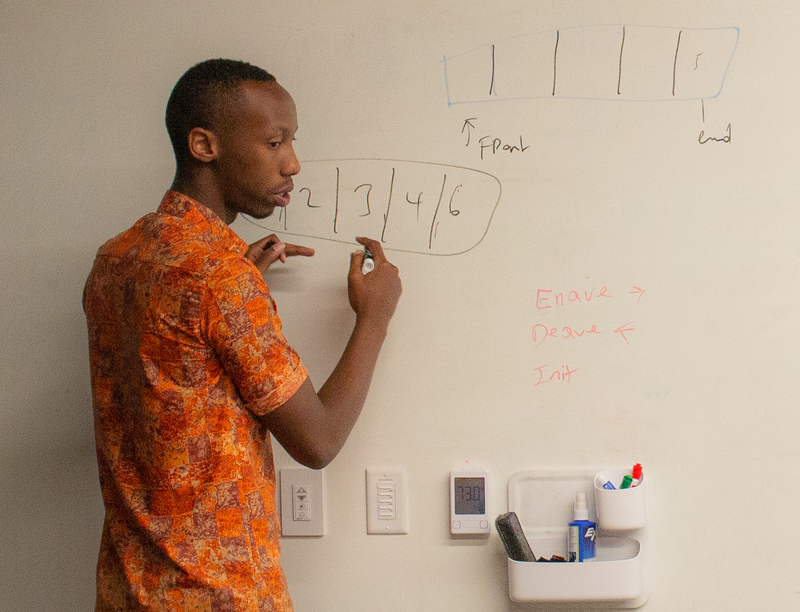 Nouru Muneza, a fellow in The Hidden Genius Project’s Career Prep Program, solves a coding problem during a mock technical interview. In my case, I’m a product manager who saw a problem; minorities lack access to what it takes to get into top tier tech companies, and qualified black students are underrepresented. To address this problem, I worked with The Hidden Genius Project in building the Career Prep Program, but I’ve run this project the same way I would with any other product launch. We have a design doc, go-to-market plan, and long-term vision. We marketed the program through Uber’s rider and driver apps, and using our regional Twitter handles. Internally at Uber, the launch involved collaboration across Engineering, Communications, Policy, Legal, and our People Team. In getting our engineers to mentor the fellows and give presentations during the sessions, I wanted to involve as many people from the Uber community as possible, because this is not only an education for the fellows. Our employees get to interact with a demographic that might be out of their usual experience. It’s a good lesson because the engineers are encountering people who are fully capable of doing the same kind of work, but they come from an entirely different place. And yet, they’re having fun learning from each other, and bringing together people with different vantage points ultimately leads to better work. How are you measuring success with the Career Prep Program? Our success metric is the number of fellows converted to an internship or a full-time opportunity in tech after completing the program. Of the 17 fellows in the first cohort, we hope that 100 percent of them get an internship or a full-time job. And that doesn’t mean they all have to come to Uber–we want to see them placed in any engineering job they find fulfilling. At the end of the program, we will have conversations with the fellows to find out what worked and what didn’t, then recalibrate our efforts to make it better. If you are interested in getting involved with this work, check out The Hidden Genius Project. Black male high school students interested in a technology career can apply to The Hidden Genius Project’s 15-month Intensive Immersion program. Black male college students majoring in computer science or a related major should check The Hidden Genius Project website this fall for details on how to apply to the Career Prep Program.